Israeli soldiers demolished, Tuesday, a two-story Palestinian building in Shu’fat refugee camp, in the center of occupied East Jerusalem. Media sources said a large military force invaded the at-Tihta neighborhood in Shu’fat refugee camp, through Ras Khamis area, while a military helicopter flew overhead. They added that the soldiers were extensively deployed in the streets and alleys, before demolishing a home, owned by members of Houshiyya family, near the Annexation Wall which separates Shu’fat from Pisgat Ze’ev illegal colony. The Israeli army claims that the Palestinian home was built without a permit from the City Council, in occupied Jerusalem. 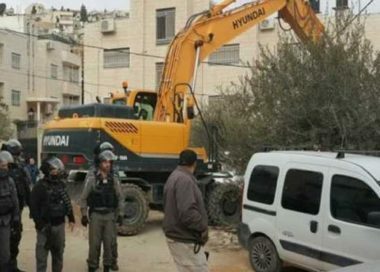 Also on Tuesday, the soldiers demolished a Palestinian home, owned by a lawyer in Bir ‘Ona area, in Beit Jala city, west of Bethlehem, in the occupied West Bank. In related news, the soldiers shot and killed a young Palestinian man, identified as Mohammad Ali Dar Adwan, 23, in Qalandia refugee camp, north of Jerusalem.